Meier, B. M., Evans, D. P., Kavanagh, M. M., Keralis, J.M., and Armas-Cardona, G. Human Rights in Public Health: Deepening Engagement at a Critical Time. Health Hum. Rights 20(2): 85-91 (2019). Keralis, J. M. and Walker, D. K. Strengthening the public health case against HIV-related travel restrictions. J. Public Health Policy 39 (2018). At the nexus: How HIV-related immigration policies affect foreign nationals and citizens in South Korea. Health Hum. Rights 19(2): 123-132 (2017). Keralis, J. M. and Walker, D. K. Scientific evidence and treatment needed to combat the spread of HIV - not ineffective travel bans. Policy adopted by the Policy Committee of the World Federation of Public Health Associations at the 15th World Congress of Public Health, Melbourne, Australia (2017, April). Opposition to Immigration Policies Requiring HIV Tests as a Condition of Employment for Foreign Nationals. Policy adopted by the APHA Governing Council at the meeting of the American Public Health Association, Denver, CO. (2016, November). Opposition to Policies Requiring a Negative HIV Test as a Condition of Employment for Foreign Nationals. Interim (late-breaker) policy adopted by the APHA Governing Council at the meeting of the American Public Health Association, Chicago, IL. (2015, November). Ma, W., Lin, H., Liu, T., Xiao, J., Luo, Y., Huang, C., Liu, Q., Chu, C., Zeng, W., Hu, M., Keralis, J. M., Onyango, E., Opitz-Stapleton, S., Nadin, R. and Kierath, S. Human Health, Well Being and Climate Change in China. In: Nadin, R., Opitz-Stapleton, S. and Xu, Y. (eds.). Climate Risk and Resilience in China. Routledge (2015). A Closer Look at Current Barriers to Improving Knowledge Management Practices in Public Health and Potential Solutions. Cadence Group [Online] (2014, December 19). Kasner, E. J., Keralis, J. M., Mehler, L., Beckman, J., Bonnar-Prado, J., Lee, S.-J., Diebolt-Brown, B., Mulay, P., Lackovic, M., Waltz, J., Schwartz, A., Mitchell, Y., Moraga-McHaley, S., Roisman, R., Gergely, R. and Calvert, G. M. Gender differences in acute pesticide-related illnesses and injuries among farmworkers in the United States, 1998–2007. Am. J. Ind. Med., 55: 571–583. doi: 10.1002/ajim.22052 (2012). Drug cartels in Mexico. Forced Migration Review 37 (2011). Beyond the silence: sexual violence in eastern DRC. Forced Migration Review 36 (2010). Khan D, Hamilton B, Rossen LM, He Y, Wei R, Dienes E. Teen birth rates for age group 15–19 in the United States by county, 2003–2015. National Center for Health Statistics. 2018. (Designed by JM Keralis, D Khan, B Hamilton, and Y Chong: CDC/National Center for Health Statistics. Approaches to HIV Prevention in the US and South Korea: A comparative analysis. Presentation at End Stigma, Picture Health: A Discussion about HIV in Korean Society (seminar), Seoul, Republic of Korea. (2018, August). Challenging HIV-related travel restrictions: Successes and lessons learned in public health advocacy and international law. Oral session presented at the meeting of the American Public Health Association, Atlanta, GA. (2017, November). Mandatory HIV testing of immigrants in South Korea: An update on advocacy efforts and legal challenges. Oral session presented at the meeting of the American Public Health Association, Denver, CO. (2016, November). At the nexus: How HIV-related immigration policies impact both foreign nationals and citizens in South Korea. Paper presented at the World Human Rights Cities Forum, Gwangju, Republic of Korea. (2016, July). Keralis, J. M., Norkin, S., Campagna, J., and McFarlane, J. Data Matching to Assess and Improve HIV Testing Data Quality. Poster presented at the meeting of the National Association of State and Territorial AIDS Directors, Washington, DC. (2016, May). Mandatory HIV Testing for Foreign Nationals in the Republic of Korea: Human Rights Violations and Bad Public Health Policy. Oral session presented at the meeting of the American Public Health Association, Chicago, IL. (2015, November). South Korea still requires HIV test for some visas, as its own HIV rates climb: This was a special article I wrote for Humanosphere on South Korea's policy of mandatory HIV testing for certain immigrants, while its own domestic HIV rate continues to climb. Open to potential: How embracing open data can advance public health practice, governance, and research: This is a six-part series on the role of open data in public health that I developed for Cadence Group. Open Data: What is it and Why is it Important to Public Health? The Missing Pieces: How Better Knowledge Management (KM) Can Complete the Public Health Puzzle: This is a five-part series on the importance of knowledge management in public health that I authored for Cadence Group. The Point of the Puzzle: How Can Public Health Save Lives with Good Knowledge Management? Fitting the Pieces Together: How can Public Health Organizations Save Time and Resources with Good Knowledge Management? Finding the Right Piece: How Can Public Health Use Knowledge Management to Preserve its Expertise? Puzzle Problems: What are the current barriers to implementing good knowledge management practices in public health? An Ounce's Worth: In 2011, I regularly blogged for Medscape, covering a wide variety of domestic and international public health topics. SENSOR-Pesticides. Wikipedia article (created in 2009). The Devil You Know. Gwangju News (2018, October). Human Rights Win: NHRCK Backs the UN Ruling against HIV Tests for English Teachers. Gwangju News (2016, December). Gwangju Should Stand for Human Rights by Standing Up Against Forced HIV Testing. Gwangju News (2016, July). Tricky Science, Real Risk: Climate Change and Health. Gwangju News (2015, December). Public Health Hindsight: How Well Did Korea Handle its MERS Outbreak? Gwangju News, (2015, September). United Nations Declares South Korea’s Mandatory HIV Testing for Foreigners Is Racial Discrimination Gwangju News (2015, July). HIV in Korea: A Tangled Mess of Law, Stigma, and Bad Public Health. Gwangju News (2014, December). Ebola: Know Your Epidemic (So You Can Separate Fact from Fiction). Gwangju News (2014, October). Disaster Relief and the Philippines: Inform Your Good Intentions. Gwangju News (2014, January). "Visa restrictions for HIV-positive immigrants still in place in dozens of countries." South China Morning Post, February 5, 2019. "New Associate Director of Public Health Services at Cadence Group." Cadence Group, July 18, 2017. "International Health Section preps young professionals for their future." The Nation's Health, May 2017. 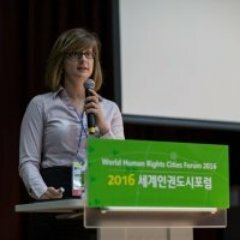 "Jessica Keralis - Controversy surrounding Korea's HIV tests for certain visas" [radio interview]. This Morning with Alex Jensen, TBS eFM radio program, November 7, 2016. "ALA Graduates its Fifth Class." The Connection, December 14, 2015. "The Power of Failure." New York Times Opinionator Blog, November 28, 2012. "International Health Section blog helps health professionals communicate." The Nation's Health, July 2012.